A sacred city for Hindus and thought by many to be the place where Buddhism formed as a religion, Varanasi leaves an imprint on the hearts and minds of visitors regardless of their creed, race, or religion. Varanasi is known for nature, historic sites, shopping, spas, and museums. 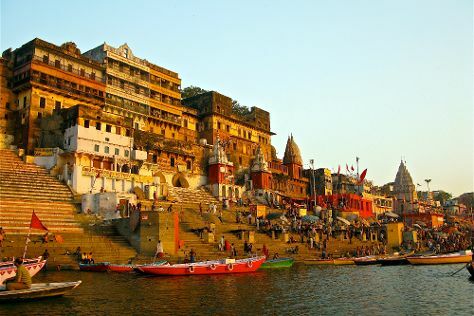 Your plan includes some of its best attractions: contemplate the waterfront views at Ganges River, soothe aching muscles at some of the top local wellness centers, make a trip to Banaras Ghats, and contemplate in the serene atmosphere at New Vishwanath Temple. To see other places to visit, ratings, more things to do, and tourist information, refer to the Varanasi tour itinerary planner . In May, daily temperatures in Varanasi can reach 47°C, while at night they dip to 31°C. Finish your sightseeing early on the 17th (Thu) so you can travel back home.